Blog Home > Essay Samples > Formula 1 Grand Prix in Sochi: Who Is the Winner? Formula 1 Grand Prix in Sochi: Who Is the Winner? The Formula 1 fans’ dreams have finally come true! The Sochi Grand Prix turned out to be an intriguing and impressive event. And here comes the winner – Lewis Hamilton and his Mercedes team! It was a truly great moment when the winner was accepting the desired trophy from the President of Russia – Vladimir Putin. Lewis Hamilton successfully led the race from the very beginning till the very end in order to gain his ninth victory of the season and the 31st one in his entire career. The teammate of Lewis Hamilton – Nico Rosberg – finished the race second, and the team of Mercedes, thus, won the Grand Prix in Sochi with three races left to cover. Lewis Hamilton was truly impressed by his own success. The champion said it was an amazing weekend and, what is more important, he was absolutely proud to contribute to this stunning team in order to get the first constructors. The races are professionally combined with an amazing show. The show of Cossack dances and the flags of Russian Federation impressed the fans of the Grand Prix. The Mercedes cars were absolutely dominant. Once Rosberg was out of the way, it turned to be the easiest race of the season for Lewis Hamilton. The champion pointed that once he was in the lead, all he was supposed to do was keeping the tires under control and straightforwardly managing the fuel. In other words, Lewis Hamilton didn’t have to push too much. The cars have been amazing and the man was simply enjoying his way. Since 2010 Mercedes has been successfully racing under its own name. The chairman of the team, Niki Lauda, celebrated the victory just as if he was the champion. When being interviewed Lauda did not hide his happiness and pride over the Lewis Hamilton’s victory. Well, there is no wonder about it! The Mercedes team has successfully dominated this season. The Mercedes drivers were the first to finish and second in nine races of the 16 so far in 2014. The number one reason why the Mercedes team was the dominator was the new hybrid engine specification that the manufacturers from Germany developed better than the Renault and Ferrari engine providers. 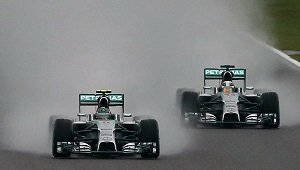 The first five cars at the Russian Grand Prix were all powered by the Mercedes engine. One more point of interest was a stunning qualifying race by a driver from Russia – Daniil Kvyat, who managed to drive his Toro Rosso to the fifth position on the grid. The 20 year old man finished the race in the fourteenth position. It is highly important to mention that only two cars didn’t make it through the race. Max Chilton’s car faced with a technical problem after only 12 laps. Thus, his team Marussia ran only one car. This essay has been written by WorldEssays.com writers.